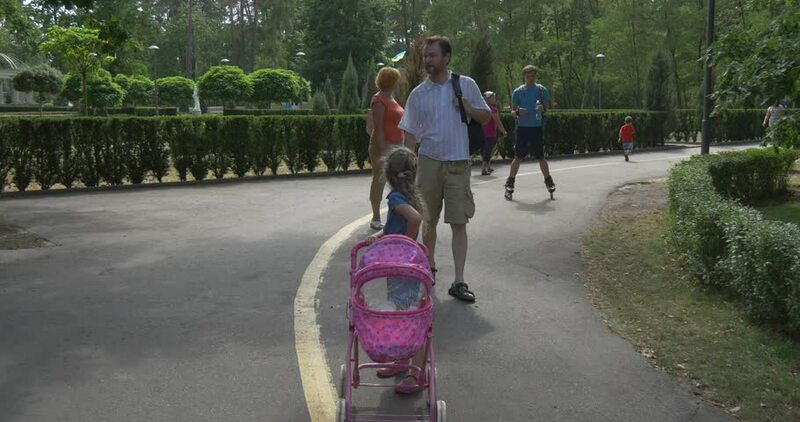 BUCHA/UKRAINE - JUL 19 2015: A girl drives a pink baby carriag, in a park, a man, probably her father, follows her, other,kids, are walking and riding roller-skaters, sunny day, Kiev, mid-shot. hd00:15Toronto, Canada - June 2015 - Young professional downhill skateboarders practice on a forested path for the upcoming contest season. 4k00:16CHIANG RAI, THAILAND - JANUARY 7: unidentified tourist visit flower festival on January 7, 2017 in Chiang rai, Thailand. 4k00:17A boy and a girl ride a scooter and talk in the park in sunny weather. The rays of the sun shine.